Introduction: Intra abdominal adhesions are responsible for 49-74% of small bowel obstruction [SBO]. Traditionally, open lysis of adhesions [OLA] is the treatment when conservative measures fail. Recent literature has shown safety of laparoscopic lysis of adhesions (LLOA) in treating adhesive SBO. In addition, length of stay and costs are less with LLOA. Despite these favorable outcomes, less than 15% of patients with adhesive SBO are managed with LLOA nationwide. 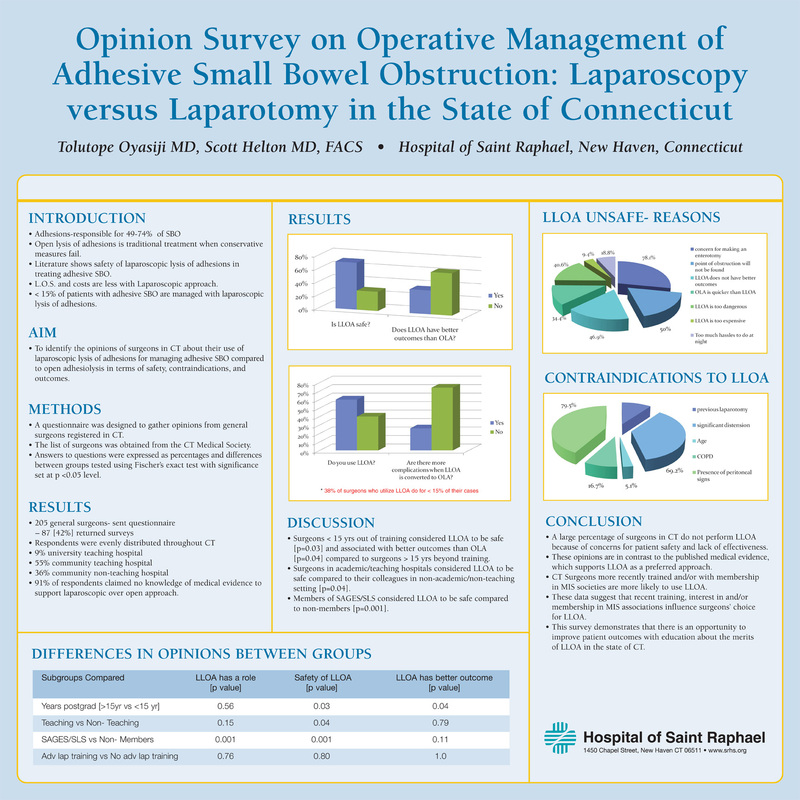 We sought to know the opinions of surgeons in CT about their use of LLOA for managing adhesive SBO compared to OLA in terms of safety, contraindications, and outcomes. Methods: A questionnaire was designed to gather the opinions of general surgeons registered in CT on this topic. A list of surgeons registered in CT was obtained from the CT Medical Society. Results: 205 general surgeons were sent the questionnaire and 87 completed it [42% response]. Respondents were evenly distributed throughout CT. 9% were university teaching hospital faculty; 55% were community teaching hospital based while 36% were community non-teaching hospital based. Answers to questions were expressed as percentages and differences between groups tested using Fischer’s exact test with significance set at p <0.05 level. *Surgeons who are less than 15 yrs out of training considered LLOA to be safe [p=0.03] and have better outcomes than OLA [p=0.04] compared to those greater than 15 yrs out of training. *Surgeons in academic/teaching setting considered LLOA to be safe compared to those in non-academic/ non-teaching setting [p=0.04]. *Members of SAGES/SLS considered LLOA to be safe compared to non-members [p=0.001]. Conclusions: Many surgeons do not perform LLOA for reasons that are in contrast to the surgical literature, which supports LLOA. Surgeons who are recently trained and/or with membership in MIS societies are more likely to use LLOA. These data suggest that recent training, interest in and/or membership in MIS associations influence surgeons’ choice for LLOA. This survey demonstrates that there is an opportunity to improve patient outcomes with education about the merits of LLOA in the state of CT.